Evoteq offices ... a flexible activity-based workspace. The office culture now encourages creativity and collaboration, says Dubai-based award-winning interior design studio Roar, which has created offices recently for key UAE firms bearing exacting this in mind. Dubai-based award-winning interior design studio Roar has been quietly creating spaces that inspire, enhance productivity and encourage collaboration – and its repeat business speaks of its success. Launched in 2013 as Pallavi Dean Interiors and rebranded as Roar in September 2018, the studio recently completed and handed over a flexible activity-based workspace for Dubai-based digital and tech solutions company Evoteq. Roar also handed over last year Edelman’s Dubai office, having earlier delivered the firm’s Abu Dhabi office. For Evoteq, Roar designers spent a lot of time with the firm’s team – who create solutions to help companies accelerate their digital transformation – to understand how they worked and what their days looked like to meet their requirements. “Office design has evolved over the last two decades, thanks in part to the metamorphosis of that office culture that now encourages creativity and collaboration. With that in mind, the Roar team was thrilled to design digital disruptor Evoteq’s 3,230-sq-ft working space in Downtown Dubai,” says Pallavi Dean, founder and creative director at Roar. Top of mind was creating a truly flexible space that could be easily rearranged to host meetings, run workshops, or launch products. Dean says it was also important that furniture played the role of creative collaborator, inspiring engagement within the team. For design inspiration, the Roar team turned to the binary code, the numeral system made up of two numbers (usually 0 and 1) that computers use. “We asked ourselves, what would it look like to creatively interpret, and even disrupt, binary?” says Dean. The answer was pairing angular shapes – representing the 1’s in binary – with circles, the 0’s. The design features a series of activity-based working spaces that are tied together to form one immersive and interactive office. The shared CEO-COO office design highlights Evoteq’s corporate culture. This isn’t a closed-off office; this space is accessible to everyone, highlighting their open-door communication policy. Roar used a series of pivoting glass doors that can be left open most of the day, or closed for private discussions. On the floor, herringbone-patterned wood inlays sit beside Volakas marble flooring, bringing warmth to the overall look. 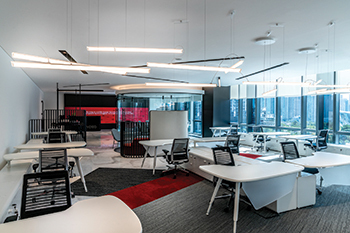 In the open-plan space, Roar used Tecno desk systems paired with Steelcase Think chairs. The organic forms work well with the circular work zones, pulling the interior architecture together. On the ceiling, a playful suspended light sculpture was created using Vibia’s hanging Halo Lineal light, the shapes paying subtle homage to the binary system. In fact, views played a starring role in this office’s design. “Sometimes, when you need inspiration, it’s great to get away from your desk, look outside, and clear your mind,” she explains. Roar designed a collaborative window-side work station to offer the Evoteq team that option. “This is an ideal deep-workspace, but it’s also a great hot desk for suppliers and sales staff who don’t necessarily need full-time spots, but just want to pop in and finish something,” she adds. The office’s ceiling-suspended floating desk, featuring deep red Rosso Levanto marble, is also a key collaborative piece. “I love this table because of its dynamic nature. Take the chairs away, and it’s a stand-up meeting area. Spontaneously gather the team, and it’s a collaborative brainstorming spot. Throw a party, and it’s a DJ booth. Host an event, and it’s a buffet table. I enjoy the idea that a piece of furniture can take on so many roles,” Dean remarks. Today, to retain top talent, companies need to offer people experience-driven offices that foster collaboration and engagement. “It was always clear that Evoteq understood that to maintain a competitive edge it had to give its team a game-changing activity-based working space in which people were free to produce their best work,” Pallavi adds. Another successful office project for Roar was a 1,000-sq-m office for Edelman at the DMCC One JLT building in Dubai, which builds on the success of the ‘Cultural Villages’ concept created for the firm’s Abu Dhabi office. To take the concept to the next level, the Dubai office was added layers of colour, texture and furniture to give each village more personality, says Dean. Edelman Dubai starts and finishes with two bold interior architectural statements – the ‘Civic Square’ and ‘Urban Park’. “At the entrance, the ‘Civic Square’ is the most dramatic space. The sweeping curves in an otherwise linear floorplate punctuated with a shallow dome in the ceiling is a powerful architectural gesture. To the back of the space, the eye is drawn to the skyscraper skyline peeking through floor-to-ceiling windows. The impression is very much that of the lobby of a boutique design hotel, with a blend of custom-designed pieces and designer furniture,” says Dean. The ‘Civic Square’ – the main reception zone – has a rich hospitality look and feel. “We wanted people to feel like they were walking not into an office, but a boutique hotel,” adds Marcela Munoz, associate with Roar and a lead designer on the project. The Urban Park, with more sweeping curves, is a public space with an amphitheatre and cafe-style seating – perfect for lunchbreak, informal meetings and monthly company meetings. “Capping off the space is what we call the ‘City Lofts’. This is the most mature, sophisticated space in what is otherwise a playful project. It’s a flexible hybrid of a meeting room, co-working space and a private office,” Dean says. “One of the design dilemmas with a firm like Edelman is that it straddles two worlds: the staff it needs to attract are bright, young, millennial creatives in jeans and T-shirts, yet many of its high-paying clients are senior managers in banks, big companies and the government. The design had to bridge these two demographics; the City Lofts is where they collide,” she adds. The main work zone, where most staff sit, is more playful, rich with a vibrant ombre colour scheme. For Edelman Dubai, Roar conducted in-depth research combining two methodologies. The first is its own UXD (User Experience Design) process, which takes findings from focus groups, interviews, questionnaires and observation and refines them into a list of priorities. The second is the ‘Living Office’ process based on findings from the workplace psychology team at US furniture company Herman Miller. “The result was a deep understanding of the needs of senior and junior staff, and a thorough, research-based set of guidelines to frame our design decisions,” says Dean. Paintings and installations from Emirati artists Zeinab Al Hashemi and Khaled Shafar were used to add a local context to the setting. Also, the arches in the joinery and doors plus the shallow dome in the reception lobby are a very subtle nod to the Islamic world. “All of this helped to achieve one of the design goals for Edelman Dubai: create a sense of space that this is an office in Dubai, not Denver or Düsseldorf, but without resorting to pastiche or cliché,” says Dean. For the colour scheme, here again the approach was based on a study conducted by the University of Texas that shows colour impacts mood and well-being. At the entrance, blue is the dominant colour, which reflects Edelman’s branding. The Urban Park has tones of green and pink, and in between, the interior palette has an ombre gradient colour transition through the floor plate which serves as a wayfinding device and gives each department an identity. The element that connects the entire gradient effect is a series of ceiling baffles that rotate slightly to create a dynamic movement through the space. The flooring features different colours of commercial flooring company Interface’s Human Connections range which creates the colour transition on the floor – further strengthening the ceiling feature. The desks, joinery and glass partitions all match the colour of the zone they live in. Dean says most of the Edelman Dubai office has a fresh, young, vibrant look and feel. “We have a ‘go bananas’ creative lounge (wallpaper by Mr Perswall) and a ‘hanging monkeys’ phone booth room (wallpaper by House of Hackney). In terms of furniture, Roar has provided a wide range of working options aimed at creating an eclectic mix and refraining from the oft-used commercial desking and seating systems. Options included sitting and standing desks, individual office spaces and informal collaboration spaces, as well as rooms with a dedicated technical function, such as a green room for video and TV filming. “For the workstations, we made a conscious effort to vary the material and the shape of the desks. Some worktops are white while others are in wood, each with a custom colour accessory to reflect the zone it sits in. Each ‘village’ has a variety of work positions, and with each straight run of desks you will find an arched standing workstation,” says Dean. Task chairs are by Vitra and a broad variety of lighting products have been used from Flos, Estiluz, Studio Italia, Aromas del Campo, DCW editions, Seletti, Excloosiva, Petite Friture, Vibia, Zerolighting, Axo Light, and Mathieu Challieres. For the Civic Square reception area, curved forms of a Lignet Roset sofa and Driade armchairs coupled with La Palma side tables have been used, to create the impression of walking into a boutique design hotel.